Seymour Hersh's Bin Laden story: How does it match up with the conspiracy theories on Infowars? 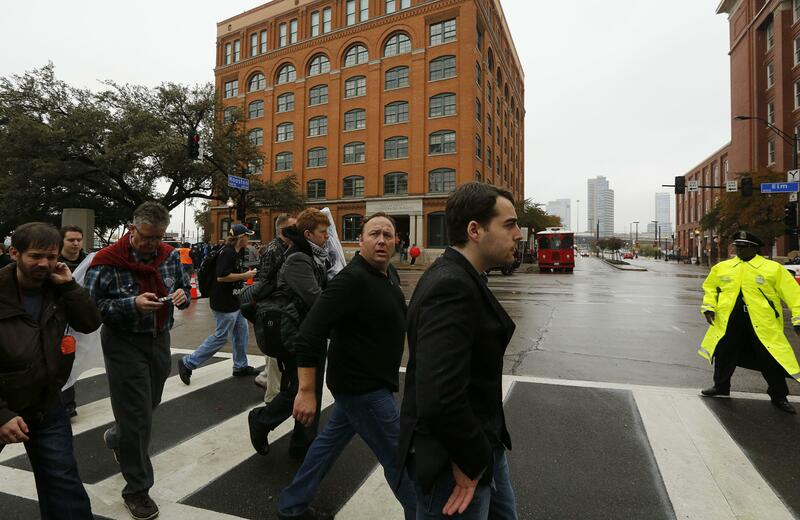 Famed talk show host and conspiracy theorist Alex Jones (center, looking toward camera) walks past the Texas School Book Depository in Dallas. A new London Review of Books story by investigative journalist Seymour Hersh asserts that the commonly accepted story of Osama Bin Laden’s May 2011 death via chaotic nighttime raid is a propaganda hoax. Moreover, Hersh claims that the al-Qaida leader’s killing was actually carefully coordinated by United States and Pakistani authorities. Hersh’s account is questionable for a number of reasons, to the point that a debunking on Vox called it a “conspiracy theory.” That wording made me wonder: How does Hersh’s version of the Bin Laden raid compare to beliefs espoused about the same incident by the truly committed conspiracy theorists at InfoWars, the web’s leading outlet of 9/11 trutherism and other paranoias? Is Hersh, who not too long ago was published in the New Yorker, really moving into the territory of charismatically insane Texas-based radio host and InfoWars founder Alex Jones—who believes, among other things, that Obama provoked civil unrest in Ferguson so he could ultimately establish a dictatorship? InfoWars’ skepticism about the commonly held story of Bin Laden’s death is laid out in this post. It observes discrepancies between different accounts of the raid, purports to undermine the veracity of material released by the Obama administration (by arguing that certain features of a 2010 Bin Laden video suggest it was staged, for example), and makes some broad arguments about the U.S. military’s unreliability and the potential political advantages of manipulating public sentiment re: al-Qaida. Hersh’s account is, let’s say, significantly more believable than InfoWars’. But the narratives have some similarities. Hersh aims to undermine the commonly held accounts of the Bin Laden raid by questioning the logic of certain reported details and corroborating evidence. At the same time, his own account of what did happen doesn’t include corroborating evidence like interviews, even anonymous ones, with the many Pakistani officials who are said to have collaborated on the Abbottabad operation. It doesn’t refer to any documents, or even to the existence of any documents, that would indicate U.S.-Pakistani cooperation. Hersh challenges the accounts of SEALs who’ve said they were at the raid with the thin suggestion that those SEALs’ memories of a firefight on Bin Laden’s property were the delusions of “a deep-seated need” to believe they had participated in something more complicated than a staged execution. As the Vox piece points out, Hersh’s belief that the Obama administration lies without remorse and was cooperating with Pakistan all along allows him to explain the two parties’ public feuds—and any other inconsistencies between his story and the historical record—as sneaky hoaxes meant to distract from what’s really going on. It’s this commitment to counternarrative totality—the idea that a few legitimate questions make the entire official narrative a lie, accompanied by a certainty in a counterhistory based on theory, suggestion, and a relatively negligible amount of secondhand evidence—that make Hersh’s account reminiscent of what you might see from the professional conspiracy theorists at InfoWars. It privileges the accounts and suggestions of a few vaguely connected ex-insiders over other, more exhaustive accounts based on the testimony of people who are in a much better position to know at least some of the facts. And it assumes a level of cooperation between apparently conflicting forces (the United States and Pakistan to Hersh, every powerful group in the world to InfoWars) that defies both evidence and common sense. Seymour Hersh may not believe that the United States shot an Osama Bin Laden body double a decade after his actual death and then blew up the SEALs who could’ve told the truth about what happened. But his London Review of Books story does seem to have something in common with the kind of thinking that leads to total faith in such farfetched beliefs.